Protesters were outraged at the revelation that a mobile phone firm has had an antenna on top of an Oxford maternity unit for 14 years. The existence of the antennas at the John Radcliffe Hospital women's centre was only brought to light after Orange approached NHS managers with proposals to add a 3G network link. Although the Oxford Radcliffe Hospitals NHS Trust, which oversees the JR, turned down the request, it has admitted the phone company has had an aerial on top of the seven-storey building in Headington since 1994. It defended the siting but refused to say how much it is paid to allow the antenna. About 5,500 babies are born at the women's centre and 700 newborns are treated at its special care baby unit every year. Grandfather-of-eight Mick Haynes, 67, who has successfully fought against four antenna proposals in nearby Marston, was angry no-one was told about the aerial. The 67-year-old retired scaffolder said: "I think this is terrible quite honestly. To put one on a hospital is ridiculous, but to have one on a maternity unit is insane. "I should think new mothers will go mad about this. The hospital has gone behind everyone's back, because no-one around here knows anything about it. "When I've done petitions I find young mothers are particularly concerned for their children. "We're really concerned about the health risks. "Experts aren't 100 per cent sure they're dangerous, but they're not 100 per cent sure they're safe either. "You're not allowed to use a mobile inside hospitals and yet it's okay for them to have a mast on top." John Willis, whose wife Rachel was treated at the John Radcliffe Hospital's maternity unit after their daughter Lucy was born in an A34 layby in June, believes people have the right to know where phone masts are sited. The 36-year-old from Drayton, near Abingdon, said: "The whole problem is that nobody can give you accurate information about the health problems caused by masts. "My personal opinion is that a maternity unit is not a good place for a mast, but I assume the JR managers would immediately take it off if evidence ever proved it was harmful." Yasmin Skelt, of Mast Sanity, a UK organisation fighting against the insensitive siting of mobile masts, added: "The general population may not be at a very high risk from antennas, but pregnant women and babies need special care. "It's mind-boggling that phone companies and hospitals can get away with this type of thing." Orange said the radio base station at the JR, which has two satellite dishes and six antenna, provided "essential network coverage" for customers using its mobile service, and the lease had been negotiated with the ORH. A JR spokesman said the mast was put up after a "careful review of Government policy and available evidence" and the agreement with Orange was kept under review. She added: "There's agreed national and international safety guidance on mobile phone mast emissions, which we follow. "We had the base station independently audited by the Radio Communications Agency (now OFCOM), which confirmed the level of emissions was well below the permitted levels. Patient safety, of course, remains of paramount importance and we'd review our position if new Government policy was produced, or new evidence became available." A lack of lighting in an Oxford park is making the facilities unusable on winter evenings, according to residents. And Mick Haines, who lives in the same road as the park, has collected more than 600 signatures from the local community in support of his campaign to get lighting installed at the so-called 'street sports' site, in Croft Road Park, Marston. He said it was yet another example of the area being treated as the "poor man of the city". Mr Haines said: "They spent all that money putting these facilities into the park and no-one can use them because we don't have any lights - it's ridiculous. "Other areas that have the same facilities have lighting in them - look at the one near Wood Farm in Hollow Way, that has lights, as do the ones in Barton and Blackbird Leys. "Marston is the poor man of the city, and we never get the same provision as other estates. "This street sports site is a great place for kids and young people to go and play and stay out of trouble, but if it is pitch black there isn't much chance of that happen- ing." 'Street sports' sites are fenced off play areas with markings for a range of sports, including roller hockey, basketball and football. Hillary Godfrey, of Lynn Close, backs Mr Haines's campaign. She said her two sons, Paul, 13, and Damien, 15, were losing out. She said: "My kids want to be able to go there after school and play, but they are losing out because lights weren't installed when all the equipment was put in and it is too dark. "It's just plain stupid not to do something about this." Damien added: "We just want to go and have a kickabout after school. We have about an hour before it gets dark, but we like to play for longer than that. "We all get really bored as there is nothing else to do around here." Oxford City Council said the cost of providing lighting at the site would be about £30,000, with annual maintenance and running costs of about £600. A council spokesman said: "This matter has been raised at the local area committee so the council will be looking into potentially funding it in the future, following further consultation." Poor lighting along a cycle track in Marston, Oxford, is making it unsafe to use, locals say. Almost 700 people have signed a petition organised by Croft Road resident Mick Haines, calling on Oxford City Council to install lighting in Croft Road Park, along the track which eventually runs to University Parks. Mr Haines said: "It's only taken me a little over a week to get all these signatures. "I've had a fantastic response from everyone I've spoken to. I've been fighting for these lights for a long time, and so far nothing has happened so I decided to put it to the people to see what they thought." Mr Haines also wants to see lighting installed close to the sports facilities in the park. He said: "People want to come down here in the evening and enjoy the facilities but they can't. "I just feel like the area has been neglected and we are having to fight for everything." 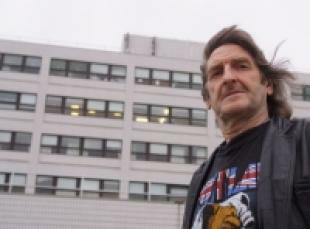 Fellow Croft Road resident John Townsend, 59, said he would back the fight. He said: "You don't walk through this park at night, it's too dangerous." Crotch Crescent resident Adele Stevens, 34, said: "That particular cycle route and path is very convenient for a lot of people, but they won't use it late at night. It's pitch black down there cycling or walking across the park and, as a woman, I just don't feel safe." Ian Phipps, 17, of Marston Road, added: "If they had lights down on the street sports site, me and my mates could use it after dark. "I know what people would say, 'we don't want kids knocking round here late at night'. But there's nothing to do when your my age other than play football and stuff like that. "They could put the lights on timers if they didn't want us hanging around too late." Marston councillor Mary Clarkson believes a consultation with residents would need to be held first. She said: "If the majority of people living in the area supported the idea and the police were on board, then I would support it. "There are some people whose homes back on to the park that might not like bright lights shining in their windows, so that is an issue we would have to address." A city council spokesman said: "Lighting could illuminate the street sports site but may cast the cycle track in greater darkness, so we need to look at lighting in the park generally." Bus users are having to contend with broken windows, leaking - or missing - roofs, ripped out seats, and graffiti at shelters. And Mick Haines, who uses the shelters in Marston Road, Oxford, wants the city council to do something about them. Mr Haines, 66, of Croft Road, Marston, wrote to the council complaining about the state of the shelters but said he was disappointed with the response. The council said yesterday that a shelter with a missing roof was one of a number listed for repair work. Mr Haines said: "I finally managed to contact the right person at the council, after getting passed from one person to the next, and I'm not happy. City Works wrote to me and told me that they would send a team down to replace the missing section of roof on one shelter, but that is all they have said they will do. "All the shelters are in need of work. "There are a lot of elderly people in this area that use those shelters and they have nowhere to sit as the seats have been ripped out. "And when it rains, the shelters don't really offer any protection - what with the leaky and missing roofs and the missing windows." In a letter to Mr Haines, the council's City Works department said only the most urgent repairs were being dealt with. The letter added: "We are currently in negotiations with bus shelter suppliers in order to replace a number of existing shelters and provide some new ones, where required, and we are hopeful of reaching agreements shortly." It said the department was unable say when work would be carried out. Headington Hill and Northway councillor Moh- ammed Altaf-Khan has backed Mr Haines in his campaign. He said: "Some of them are falling to pieces. I use them myself and I think they need replacing, not repairing." Mr Khan admitted that trying to make improvements to bus shelters could be a confusing matter. He said: "The county council is responsible for maintaining the actual stops, but the city council maintains the shelters. "I'm a city and a county councillor and I find it confusing when I try to think who is responsible for their upkeep." A city council spokesman said: "We have had a small quantity of work ordered on a few bus shelters which are deemed to be in the worst state of repair. "In most cases the work has involved panels being replaced and some painting work. This work is still ongoing. 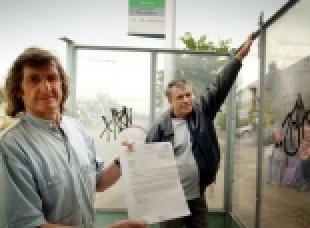 "The bus shelter in Marston Road is one of those in the programme and will also have repairs to the roof carried out."